Especially new readers who are not yet familiar with Religioscope may be curious to know more about its background and purpose. We have attempted here to summarize our answers to frequently asked questions. Launched in January 2002, Religioscope is a independent website about religions in today’s world. It offers news and analyses. Religioscope pays attention to current developments and trends, but would also like to put them into historical perspective when needed. It would like to offer to its readers some keys for a better understanding of the role and place of different religions. Religioscope ® is a registered trademark. 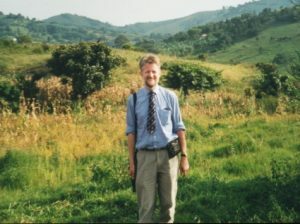 Jean-François Mayer, editor of Religioscope, during a research trip in Uganda in 2001. The founder and editor of Religioscope is Jean-François Mayer, born in Switzerland in 1957. J.-F. Mayer received his doctoral degree in history in 1984 from the University of Lyon, France. J.-F. Mayer is the author of several books and many articles on different aspects of religion in today’s world. From 1999 to 2007, he was a lecturer in religious studies at the University of Fribourg, Switzerland. From 2006 to 2010, he used to be a scientific advisor to the project “Religion and Politics” (Graduate Institute of International and Development Studies, Geneva). He also works as a consultant in international affairs (JFM Recherches et Analyses LLC). In 2007, he was one of the founders of the Religioscope Institute, based in Fribourg, Switzerland. J.-F. Mayer is the director of the Institute. Since 2008, this website is published under the auspices of the Institute. Religioscope would like to contribute to a deeper understanding of the role and place of religions in our world. It would also like to create bridges between the results of academic research and a wider audience. Is there any religious group behind Religioscope? No. We do not want to promote or propagate any belief or ideology. Our goal is not to teach people what they should believe or not believe, but provide them with information. There is no religious group financing Religioscope. Nobody can claim to be completely neutral. Sometimes, personal views of authors may appear in some articles. But we are doing our best in order to be honest and intellectually rigorous, independently from our own beliefs. From the very beginning of Religioscope, we have been pleased to see that many readers, coming from all corners and representing the widest possible variety of viewpoints, have understood what our perspective is. Those readers know that Religioscope won’t be advertising their views, but they appreciate our efforts to report honestly, in a non polemical way. Is there any commercial interest behind Religioscope? No. As you can see, there is no advertisement on Religioscope, access is entirely free and nothing is sold. We hope to find some day a financial support in order to fully professionalize Religioscope. Proposals are welcome – but only if a grant would not compromise our independence and freedom, which are the main assets of this website. Is there a difference between the content in English and the content in French? Yes. Both contents are completely different. Until 2016, both contents were on the same site, with a common access page. Since Autumn 2016, the French site and the English site are separate, but interconnected. The mother tongue of Religioscope’s chief editor is French. Originally, Religioscope was launched with French as its primary language, but it has attempted to give space to material in English as well, as a service to a wider circle of readers. At this stage, the percentage of articles in both languages is roughly similar. 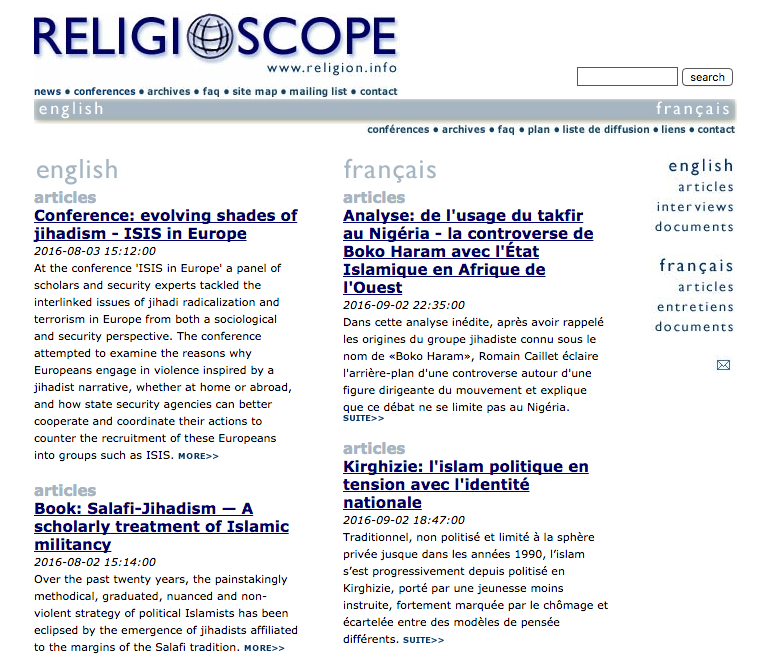 Among articles specifically produced for Religioscope, there are still more in French than in English. Did the design of the website change over time? Definitely! When it was launched in 2002, Religioscope used to have a simpler, less professional design. It was changed first in early 2003, at the time we began to use a content management system in order to publish articles. The website was completely redesigned in April 2004. This explains why some archived documents (especially articles published before April 2004) may have a slightly different outlook, since it was not possible to reformat each of them completely during he successive steps in the development of the website. In 2016, the website was entirely redesigned and moved from its previous CMS, Article Manager (Interactive Tools), to WordPress. All the existing articles were imported and individual redirections were created for each one, thus allowing readers to access the entire content, even in case they have kept a previous URL. We are committed to permanent links: redirections allow us to keep this commitment. The website in late Summer 2016, before the switch to the new layout. If you come across some old URLs, you may notice that they are not always linked to www.religion.info. This is a legacy or our history. 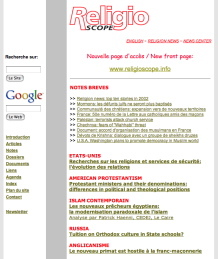 In 2002, Religioscope was published at the URL www.religioscope.com. In 2003, it switched to www.religioscope.info for new articles. Since April 2004, our main address has become www.religion.info. Articles originally published on one of the two other websites are redirected to the new location. Who produced the elegant design of Religioscope? We are glad to be able to seize this opportunity to thank the two people behind the current design. Our logo was created by Ken Harper. An expert in visual communications, Ken Harper has already worked for several leading American media as well as international organizations. 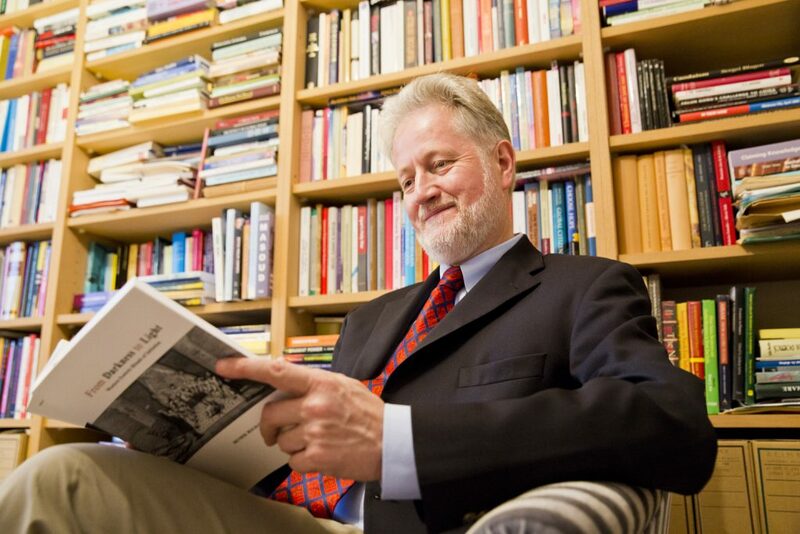 Since 2008, an Associate Professor and the first director of the Newhouse Center for Global Engagement at the S.I. Newhouse School of Public Communications at Syracuse University. The website itself had originally been redesigned in 2004 by Nigel Parry. Since 1995, Nigel Parry has been designing and developing websites and website content for educational, advocacy, non-profit, and business organizations. Together with an experienced network of consultants around the world, Nigel offers complete website, multimedia, and print solutions for clients of all sizes, in any geographical location. In 2016, Nigel Parry was again in charge of redesigning Religioscope, providing both continuity and change. Visit his website and look at his portfolio! His motto is: “Website design for clients who have something to say.” If you are a webmaster for a website with news content, consider hiring him, you won’t be disappointed! Where can I find the list of academic conferences about religious topics? The website included such a list until 2016, but it has been discontinued: we could anyway only offer a selection, and there are today many other websites offering a much larger selection. Please, check websites such as Conference Alerts or Calenda as well as listings on the websites of academic societies in the field of religion. If I am looking for information on some topic related to religion in today’s world, is it possible to send questions and queries to the editor? Sorry: you should understand that we are providing this website free of charge, and that it means a lot of work. We just have no staff available in order to handle such requests. We recommend that you use our search engine in order to explore our website’s ressources and Google in order to find material on the Web. And don’t forget your local library!